I woke up this morning with this story in my head. Last Sunday I preached on the Matthew 6:12 text, "...forgive us our debts, as we also have fogiven our debtors." (See also vss. 14-15) That was apparently still rattling around in my brain. Wendell Zink showed up at heaven's gate pulling a red wagon. A large ornate book, at least 12-inches thick, sat in the middle of the wagon bed. The gate attendant stepped in front of Wendell just as he was about to set his right foot into heavenly territory. "I'm sorry sir, you'll have to leave that outside," said the angel. "I can't bring my wagon into heaven?" Wendell looked perplexed. "No sir, I'm talking specifically about the book," said the angel. "It won't fit through the gate. And they were outlawed 2,000 years ago." "Books aren't allowed in heaven?" the bedraggled wee man asked in a high pitch voice. "Well, sir, no -- at least not those books." He pointed to the tome in the wagon. The angel had seen several such books before -- personal journals in which the writer keeps track of all of the offenses that have been done to him throughout his life. Every unkind word, every incident in traffic where he was squeezed out of a lane, every time someone took unfair advantage of his small stature (as both a child and an adult!) -- with each offense Wendell had made an entry into his big book. "But...but I need this book!" exclaimed Wendell. "This is my life's work-- my most precious possession and I've been waiting my entire life to show it to God." "I'm sorry, sir, as you can see it just will not fit through the gate." 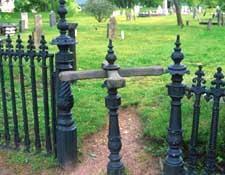 Wendell, for the first time, noticed that the gate into heaven was really a turnstile -- a NARROW turnstile with room for a single person and nothing else. "But," said Wendell, "can't I just hand the book to you and have you carry in through a delivery entrance or something?" "Not really, sir. These kinds of books are incompatible with the heavenly covenants and conditions." At this word Wendell's face was seized by anger and disappointment. He was lost. For the very thing which defined his life was being excluded from his future. "How could this be?" he seethed. "Doesn't God know the pain I've endured at the hands of others? You can't really expect me to leave it all behind! What does God know about hurt... all up here sequestered from the real world? As he turned to walk the other direction, wee Wendell was growing weer by the minute. He was barely able to pull the red wagon which was now an inch or two higher than Wendell. But he still managed to make considerable noise -- grunting and groaning as he arduously pulled away from the gate. He was a man on a mission -- to get far enough away so that he could comfortably add yet another entry into his big book.